Violence against women is a serious problem with multiple consequences to families in South Carolina. In escaping an abuser or violence, women often have to give up jobs, find new housing, and protect their children around the clock. Through working with partners like the South Carolina Coalition Against Domestic Violence and Sexual Assault, WREN provides advocacy support on a state level. In the age of the #MeToo movement where sexual assault is being discussed on state and national platforms, it’s up to each of us to hold our communities and institutions accountable for policies that support the safety and well-being of women and families. In South Carolina, the femicide rate (in which a woman is murdered by a man) is often over twice the national average. 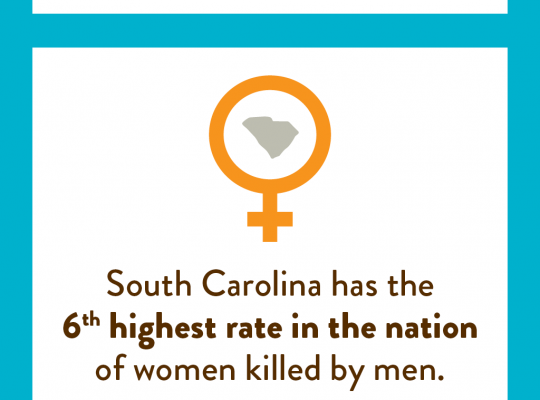 In every year that records have been kept, South Carolina ranks in the top ten states in the nation in the rate of women killed by men. For homicides in which the weapon used could be identified, 59 percent of female victims (26 out of 44) were shot and killed with guns. Although an estimated 87 to 94% of those who experience sexual harassment never file a formal legal complaint, during fiscal year 2016 alone, nearly 7,000 sexual harassment charges were filed with the EEOC, and 82% of those sexual harassment charges were filed by women. Per 100,000 women workers, Black women filed sexual harassment charges with the EEOC at nearly 3 times the rate of White, non-Hispanic women. WREN educates the public on domestic violence issues and promotes laws and policies that create an environment where women and girls are free from violence.